Nautica is a 33 story building located on Indian Creek Drive, a small roadway on the western side of Miami Beach. Nautica's location puts it right by the waterfront and residents enjoy unobstructed views of Allison Island. La Gorce Island and the sprawling La Gorce Golf Course. You'll need to head up to Nautica's rooftop if you'd like to take a dip in the swimming pool. The deck also includes a spa, a sitting area designed for some rest and relaxation, sauna and steam rooms and a health and fitness center featuring a variety of modern equipment. Seafaring enthusiasts will be pleased to know that there are eight boat slips available at the Nautica condo. 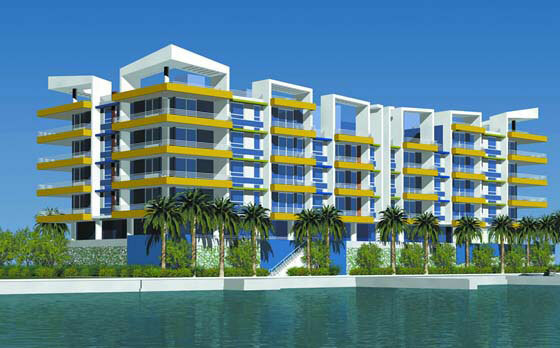 The Miami Beach condos for sale of Nautica have two, three or four bedrooms. The namesake beaches of the city are east of Nautica and extend north and south for several miles. Barely ten minutes to the south is Lincoln Road where you can shop, dine or just sit down and watch the people that are usually a mix of locals and tourists from around the globe. If you continue south you'll eventually reach South Beach, home to Ocean Drive. Bal Harbour is just north of Nautica and Miami Beach.